Danaë Simmermacher: "Non qua servus est, sed qua homo." Der rechtliche Status von Sklaven bei Luis de Molina, SvSal WP No. 2014-02. Luis de Molina (1535-1600) grants slaves a legal status through which they can take up a position with respect to their masters between equivalent legal entity and legal object. Here, what is decisive is the figure of the subjective right, which both for Molina and modern proponents of this legal concept describes the 'right per se'. According to Molina's definition of ius, the denial of a subjective right or the hindrance of exercising an individual right represents an injustice. The rights granted to a slave in virtue of his being regarded a human being (despite the condition of slavery) serve to protect the slave against unjust acts. 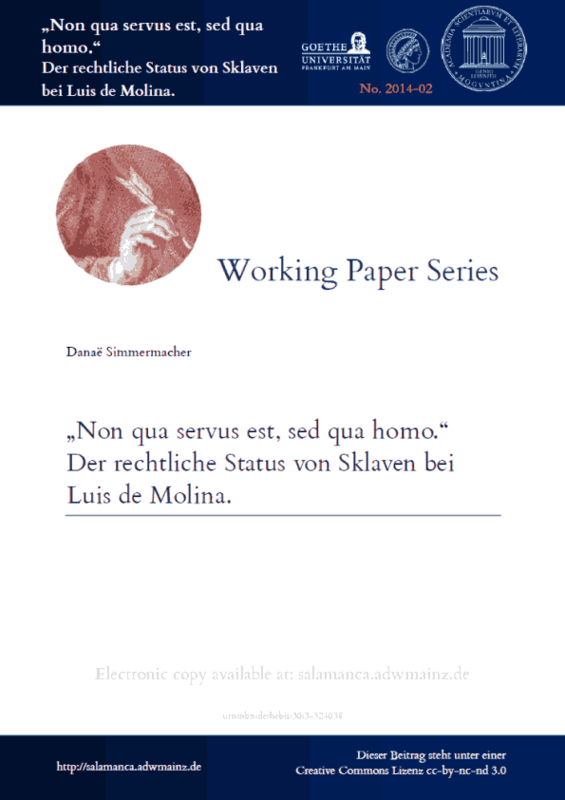 Molina does not distinguish the slave as a legal entity as separate from his master insofar as the slave should be protected against injustices committed against him or his property; injustices for which he would be entitled to compensation. Yet, the slave is not able to stake his claim to a particular right because it is not possible for him to take the matter to court. His natural law justified coequal legal status with respect to his master is limited in such a way by the positive legal order (by means of which slavery is generally made possible) that he is to be held legally incompetent as a legal entity with regard to defending and enforcing his 'qua homo'-legal rights. This precarious situation is due to the complicated legal intermediate position of a human legal entity, which, at the same time, represents the legal object of another person.